My husband worked at Olive Garden when he was younger. And one of the dishes people always loved was the Olive Garden Zuppa Toscana Soup. Basically, it’s Italian Sausage Soup with Kale. And while you might not think of having kale in a soup, you’re going to love it. Kale is considered a superfood by many, and this is a super delicious way to prepare it. Eating kale has shown to reduce cholesterol, reduce cancer risks and help detoxify the body. Due to the importance of kale you’re going to start seeing it everywhere. Yes, it’s that important. This is a good foray into the world of kale. The fat in the soup will actually help your body absorb the important nutrients found in this green. So go ahead! Eat your greens. Eat your soup. Preheat oven to 300 degrees Fahrenheit and bake until no longer pink, bout 30 minutes. Slice the potatoes between 1/8 inch and 1/4 inch, making the slices about the same size so they cook evenly. Olive Garden Zuppa Toscana Soup is Italian Sausage Soup with Kale. And while you might not think of having kale in a soup, you're going to love it. Slice the potatoes between ⅛ inch and ¼ inch, making the slices about the same size so they cook evenly. Just sent the list of ingredients for my husband to pick-up on the way home! YUM! Can’t wait to make this-hopefully it will help my littles kick this crud. Thanks for posting! This is my favorite soup at Olive Garden. Glad to have you visit, Becky. Please let me know what you think of the recipe when you make it! From one Jenny to another 🙂 Thanks for linking to Oh My Heartsie Girl! Always glad to share 🙂 And happy cooking this weekend! Looks so good. We love Olive Garden Soups. Thanks for sharing your recipe at the party. Hope to see you again this week. Shared…. Thanks for sharing this amazing recipe with us on Weekend Bites! Find it on today’s features. It’s one of my husband’s favorite dishes and I’m excited to make it for date night! Yeah!!!! Please let me know how it turns out for you! Printed for a lazy weekend or to have one hand for a quick supper! My family likes this soup and will love having it at home too! Thanks, Linda from Inspire Me Monday! 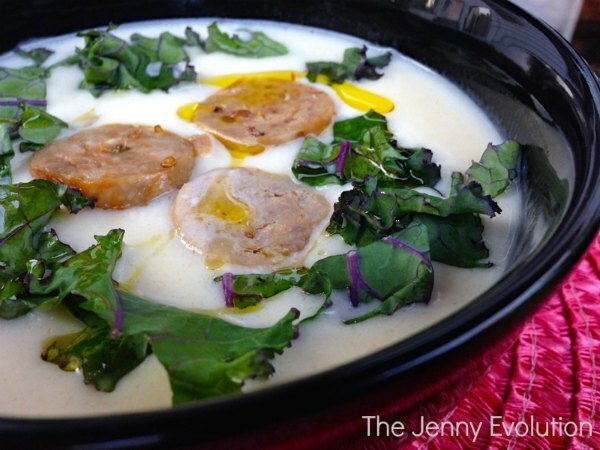 One of my favorite soups – Thanks for sharing on the What’s for Dinner link up. I have never tried this at Olive Garden, but it sounds delicious. I love Kale and put it in as often as I can. I have never had this soup but it is on my list now. Loved this soup at Olive Garden. Now I can love it at home. I honestly don’t think of Olive Garden as being low fat. I love that soup! Thanks for sharing at the What’s for Dinner party – enjoy the rest of your week! LOL! Now that’s using what’s in the fridge well.